Nestled between Cannes and the Cap d'Antibes, Golfe Juan is a popular French Riviera Villa Rental destination and a charming seaside resort with a very traditional village centre and superb marina. Golfe Juan gently slopes down from the foothills to the sea in the centre of a large natural harbor stretching from Cap d'Antibes to the East, to the outskirts of Cannes making it superbly positioned for a villa rental holiday. Ideal for family villa rentals Golfe Juan also has several miles of clean sandy golden beach extending in a shallow curve and lined with tall elegant palms. Many of the rental villas in Golfe Juan benefit from superb sea views. The small village centre of Golfe Juan is much less developed than neighboring Cannes and Antibes, having a very traditional and authentic French ambience. Villa Rental guests enjoy the range of local shops selling fresh provencal produce and market stalls selling fresh fruit and vegetables. The pace of life here is slow and revolves around fine Mediterranean cuisine. The marina area is more modern with animated upmarket nightilfe in the summer months whilst the hot spots of Juan Les Pins and Cannes are just minutes away. Transport links are excellent : By car Nice airport is around 35 Minutes whilst Cannes and Antibes are about a 10 Minute drive. 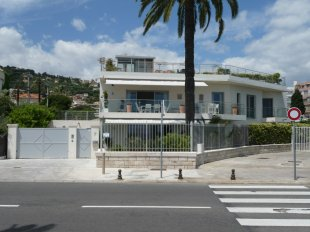 There is a private airport at nearby Cannes and also a centrally located train station in Golfe Juan with regular trains going down each side of the coast towards Marseilles or Nice. 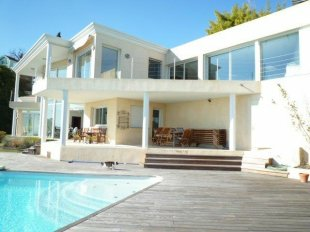 A villa rental in Golfe Juan provides a great base for an active villa rental holiday. The mountains of the Alpes-Maritimes provide skiing and boarding in the winter and hiking and biking in the summer, while the clean Mediterranean waters of the bay of Golfe Juan provide fishing diving sailing and boating.